What is the Single Most Important Aspect of Any Marine Structure? Similar to a house, the structural integrity of any marine structure relies on a strong foundation. When you hire Logan Marine, your foundation piles will be hammer driven with up to 10,000 ft/lbs. of energy in every blow, offering the most supportive AND held down installation available. In addition, we protect your timber piles against worm infestation. 1) Loose Foundation Piles and 2) Worm Infested Foundation Piles. Are you currently licensed as a general contractor in the state of North Carolina? Can you provide proof that you carry General Liability, Jones Act and USL&H government mandated Workers Comp Insurance? Do you maintain business accounts with local suppliers and are those accounts in good standing? How many client references will you be providing? 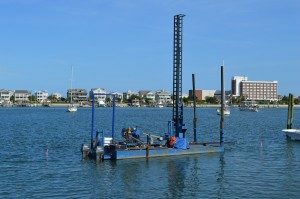 What method do you use to install pilings? How do you protect pilings against worm infestation? What type of wood preservatives should be used for marine construction projects? What type of fasteners do you normally use for framing and decking connections? Will you provide a detailed written bid with a price guarantee prior to starting? Will you provide approximate start and completion dates for my project? Can you provide written proof or examples for all of your answers? Once you ask these questions and review the answers, the quality contractors will stand out. When we meet with you, we will be pleased to provide you with our answers to these questions along with a complete copy of our Buyer’s Checklist, including a sample of the amount of detail included with every proposal. If your bulkhead, floating dock, pier, gazebo or boat lift has taken a beating and needs to be replaced, give us a call today at 910.367.1348 . If you would like to schedule an onsite review of your project please call us today at 910.367.1348 .